Is It Time for Metro Rail to Get a Face Lift? There’s a lot of positive things one can say about Metro Rail. That the train cars are attractive is not one of them. The common stainless steel train cars don’t create an attractive visage for first time rail passengers, many of whom are also confused that purple line trains are painted red. Over the break, Streetsblog reader and avid So.CA.TA. member Alexander Friedman sent me a photoshop of the standard gray rail cars with a more colorful update. Friedman’s more attractive picture raises am interesting question: is it time for Metro heavy rail cars to get a face lift? Nothing against Friedman’s wonderful rendering, but personally, the expression of applying lipstick to a pig comes to mind. I’d rather see what risks being an inordinate amount of money spent on such a cosmetic enhancement spent instead on a more practical aspect. A face lift on train interiors (like cleaning the seats, or replacing them with more easily cleaned materials) should take priority over the exterior, IMHO. How about instead they do a better job of letting folks know what train they’re on? Maybe install on-board changeable message sings? Any random purple line train leaves 5-6 people in Koreatown, who somehow think they’re in Hollywood. passengers care what color the train is. How come at LA Metro, the Red Line is announced in Spanish as “The Red Line”? The signage is pretty clear the train is headed to Wilshire/Western. I don’t know how we can “fool proof” the entire system. It’s better today that they gave the Wilshire/Western branch its own color and the monitors clearly define their destination. This is a very common problem in other cities as well, not an LA thing. I couldn’t agree more. The Red/Purple Line cars could use a serious lighting upgrade and probably some seat reconfigurations. Plenty of great rail systems (esp. Tokyo) get by with cars with very bare-bones exteriors that are very well-maintained on the inside. Meh, silver is fine, however I think all of the cars should match. The newer greay cars on the goldline are nice, now if only the blue and redlines had the same color cars, the fleet would look great, and well taken care of. Quite frankly, I am not a fan of the above car. It attracts graffiti, and the stainless steel is easy to clean in case of. Did we forget about New York in the 1960s,70s,80s, and early 90s? My rendering is just an example of a paint scheme (not necessarily the exact coloration that should be implemented!) I agree, it is a bit bright, and other colors can be used, as well. Being originally from Europe (where subway trains, as well as above-ground trains, never use ugly stainless steel that the U.S. does) I can tell that the dull, utilitarian stainless steel does put a negative image overall. Yes, efficiency is the priority, you’re absolutely right. But – making the fleet more attractive does not require much investment, it just requries some logical thinking, graphics design skills, and a comprehensive approach to making the trains user-friendly and attractive, especially to the first-time users. Gee-the color of the train matches the color of the line its painted for! What a concept! I thought “The Red Line” in Spanish is “La Linea Roja”? No, the signage is pitiful. A 25 year-old non-LED dot-matrix sign that reads “Wil/Western” or “No. Hollywood” (with 25 years of dust on the interior glass) is difficult to read as it whizzes past you at 20-plus MPH as the train decelerates into the station. I’m sure its a real treat for visitors. C) Consider installing additional destination signage above each door. D) Have the overhead flatscreens use the color of the line as background, or somewhere on the display (Red or Purple circle?) when it “announces” an arriving train. Stainless can last much longer thus lowering the per annum cost of the initial investment in equipment. A reminder that once the Regional connector is built, we could very well see the “color line” nomenclature that LA Metro is using presently go away because 1) there will be many more potential destination and endpoint possiblities (including short turns) and 2) there are more usable numbers and letters than usable color names. The trains need to be Stainless, Grey, White, or some other single neutral color to remove confusion and direct the user to the destination signage. 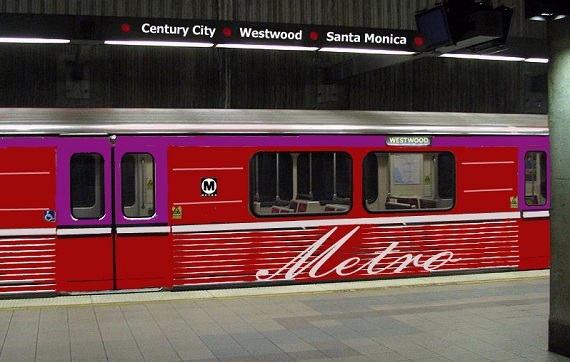 They do care when they board a train that is red in trim, still has red circles above its platform signage and has TVMs that sell only “Red Line” tickets and then that train takes them to the end of the PURPLE Line (Wilshire/Western, where the signage is still all IN RED!!!!). It can lose LA Metro a customer forever. I hate the idea of number/ letter combinations. And the Regional Connector won’t affect the Red, Green or Purple lines at all. Having too many possible destination/ endpoint combinations would be confusing. Also, it increases the chances of having to wait for the right train to show up. We need a system less like Muni Metro and more like Tokyo or London, where maps have colors and trains have names to help identify routes and destinations. I like this idea, even if I don’t like the paint scheme shown above. I see no reason why Red/ Purple trains can’t have red and purple stripes. You could probably mark Green Line trains (and even Crenshaw Line trains) with green paint. That just leaves Blue/ Gold, which ought to be popular enough in Los Angeles. The Green and Blue lines are connected and LA Metro could conceivably run a Norwalk to Long Beach or Norwalk to Downtown L.A. train. I’m not a fan of losing the colors, but there may be no alternative. How many colors are there that can be used?? That looks retarded. Leave them alone. Stainless doesn’t have to look bad but in the US it always seems to. A lack of washing and perhaps that more complicated exteriors with more ridges, lines and grooves conspire to make the trains seem older than they are. The large surface area may produce more rust or hold into it . There are plenty of examples of attractive stainless train cars in europe. Google DSB and Swedish rail for examples. One of the things that works against transit in the US is the impoverished look of equipment, rail and bus. Almost every bus in north America is white with a bit of color. This looks cheap and looks dirty pretty quickly. Unfortunately this sort of thing does matter. A more aerodynamic bus from Van Hool or Volvo painted a bright primary or secondary color (and with a good interior) can feel more light rail like than any light rail train in Los Angeles. BRT might be an easier sell in the US if more americans had experiences with good european BRT that can be aesthetically pleasing and more comfortable than US rail. You do not need white or stainless bodies to prevent confusion. Nor should the color match the line unless you plan on buying more vehicles than necessary. Pick an attractive color scheme (why is this so hard in the US? ), use lots of color, paint everything to match and then give rail and BRT number designations like people do in developed nations. In the case of metro’s subways it is the interior that is the bigger problem. Off white plastic never looks good. It looks smoked stained when it is new. In a city that is aesthetically challenged, consisting largely of grey, yellow,dirty tan and concrete and bathed in a dirty yellow smog scattered light it is really pathetic that the metro subway is full of concrete and dirty tan. It is as if the designers took inspiration for the unpleasant experience of walking on a los angles street. Transit vehicles inside and out should have lots of bright primary and secondary colors. Blue, yellow, red, green and stainless make for a cheery modern ikea like interior. I could say the same thing about architecture in LA. Enought with the damn tan stucco. Use some color please. As bad as the paint schemes are the information system is just pathetic. But then I shouldn’t expect much from a city that thinks the grove and la live are great urban design. Tokyo has 13 subway lines, each with its own color and with very few route branches. And I would rather not see trains run from Long Beach to Norwalk or downtown to Norwalk. It would be better to have transfers than too many complicated branches and routes. Ideally, I would even have a “second connector” to separate out the Blue and Expo lines downtown. Operational flexibility is always a plus. Good luck using “yellow” as a line color in the USA. Cars have operational flexibility. For subway trains, too much flexibility can be a minus. The more possible destinations you have on one track, the longer the potential wait at the platform as each “wrong destination” train passes. It makes far more sense to have a limited number of destinations and transfers. That’s another good reason for distance-based fares: you don’t pay for each transfer. Actually, a face lift is not needed now. I’d rather see later service on Friday and Saturday night then an unnecessary paint job. Regarding “downtown to Norwalk” etc. : The only connection between the Green and Blue lines (for the foreseeable future) is a low-speed north-to-east connecting track at Rosa Parks. Rebuilding this junction into what street-railway designers would call a “grand union”, allowing trains to change lines in all directions, would be a major challenge to a civil engineering team. This is one of the reasons why using the present BNSF “Harbor” line route to reach the LAX airport has drawn so much attention. In relation to the entire transit network buses and trains should be of one color scheme and thats Orange and Silver on the buses and some LRV’s that do not have the stainless steel exterior. This would show that there is a cohesive network and indentify the ease of connection between bus and rail. For the Rapids/BRT network stick with the Silver so that there’s only two types of paint that will be needed Orange and Silver. They need to be similar in style to the current facelift the light rail vehicles are getting. No, they don’t have to be yellow, but the design elements should be similar. In fact, since the LRVs are colored yellow, let’s give the same treatment for the subway cars, except they will be colored red. It’ll be a historical nod to the time when rail vehicles in Los Angeles were also colored yellow and red. The problem with giving each line its own color according to line is that with the construction of the Regional Connector, many Metro light rail lines will be interchangeable, and can share cars if needed. The new LRVs arriving are colored yellow, and they will be used for multiple lines. I say color the LRVs yellow, color the subway cars red and let’s call it a day. Washington D.C. Metro has a Yellow Line. Here’s a link to their “for discussion only” map showing potential new names. This was SUPPOSED to be done already, but got delayed. Here’s the link on Metro’s server… it was presented to the board (or a committee) last January. I saved it to my dropbox because I always have a hard time finding things again. There’s actually another one that shows the current system, without the Regional Connector (like I said, this was planned to be done already), as well as a second page that talks about why they chose the letters they did and why they skipped certain letters, etc. But I haven’t been able to find that one again.